bus ride from Oradea to the camp facility at Lunca Bradului (just north of Târgu Mures). In the bus there was our visiting short-term team from Tennessee, our three summer interns, three staff from California and all of our Romanian translators and staff. It was a long and hot ride on the bus but when we got there we were definitely very excited to get going on our week at camp. I cannot believe that I tripped when I got off the bus. What a way to start my week at camp by getting a nasty bad cut on my left leg! 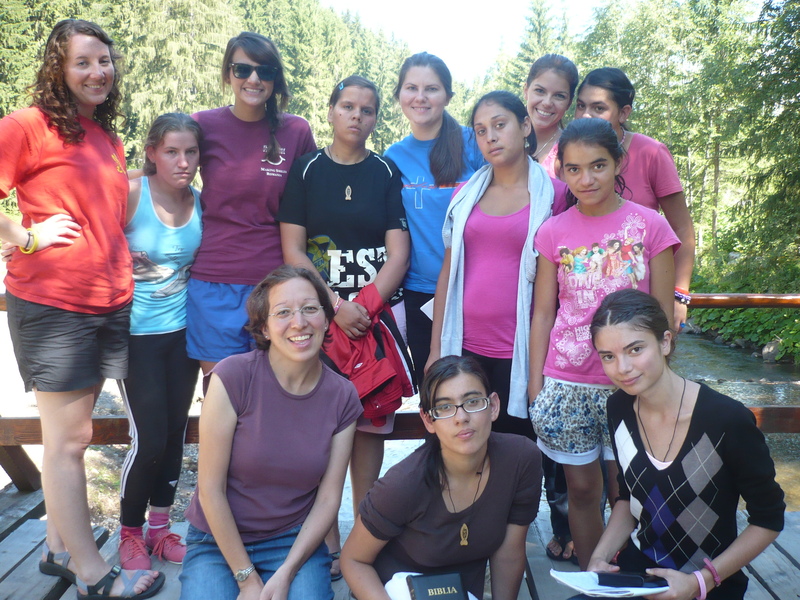 Our first day at camp was pretty much settling into our cabins (I stayed with Kim and Madison – our summer interns and the other American girls), getting to know each other and praying for the camp. The orphan kids and teens arrived on Monday (July 9th). All 60 of them loaded off the bus with huge smiles on their faces and excited about another week at camp! Hanging out with two of the boys! was the worse camp but yet it was also the best camp for me as well. It was a really difficult week for me because it was very trying and I felt like I went through a lot spiritual warfare during the week too. When I arrived at the camp I got a nasty cut on my leg when I got off the bus and then on Friday I tripped and twisted my left ankle but it was really bad on Saturday to the point where it swelled up a lot and it very quite painful. Besides the injuries that I got during the week I really felt like my patience was tested a lot because so many times I just felt that the kids (not all but some of them) were really quite disrespectful to me and very rude too which I found that it was very hard to see the way that they treated me like that. Sabina, Rudy and their baby. had a very special event for Rudy and Sabina (wedding and baby dedication), great relationships were built and we had a really great weather during the week. The amazing thing is this camp for me was the most spiritual ground breaking camp since I started working with this ministry. It was so very encouraging to see the salvation decisions that were made and the way God worked in their lives throughout the week. We talked about some big topics throughout the week at our small group in the morning and at the evening chapel – heaven, the rapture, hell, and transformed for…? The theme of the week was transformed 2 which was a continuation from two years ago. I was amazed how interested the girls in my small group were in how they asked so many questions which is great because it shows they are seeking. 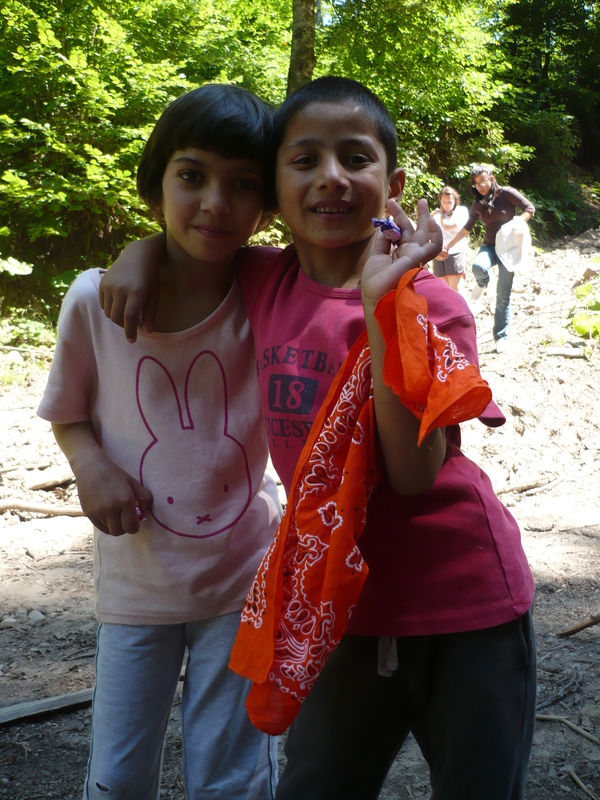 Silvia and I at camp. Sandi said she wasn’t sure so then Mirabela looked at me and told me that it would be better for us to go and sit down somewhere so it would be better for us to talk so then we went and sat down. I asked Sandi if she would like to say a prayer to receive Christ and surrender her life to Him, she then said yes and then Mirabela asked me to say the prayer and then she would translate it for Sandi. I found it so very humbling to be a part of leading Sandi to Christ and it was something that I didn’t expect either. really surprised that one of the girls (her name is Ionela) was the only one that said the prayer because her behavior was very disrespectful to me during the group time. I felt so encouraged of the two from the small group that gave their lives to Christ and it was humbling to be a part of that. Afterwards when I thought about it I felt really bad that when I led both of the girls in the salvation prayer I cannot believe that I forgot the repentance part of the prayer. When I realized that I felt so horrible. I got a chance to talk to Mirabela about that and I admitted my mistake to her when I led the prayers. She told me not to beat myself up over it because God knows their hearts and she also explained to the girls the importance of turning from our sins and living for Christ. My small group at camp. Bible study leader Patrick taught us one week really well with the letters: A, B and C. The letter A is for “admit that you are a sinner. The letter B is for “believe in your heart that Jesus is the Son of God” and the letter C is for “confess with your month that Jesus is the Son of God and you need Him in your life”. My heart was also moved when twenty one (21) other orphans (kids, teens and young adults) gave their lives to Christ on Friday evening at the chapel. I prayed during the altar call time and as I saw them go up to the front my heart was just moved so much that I just started to cry and tears just streamed down my face. 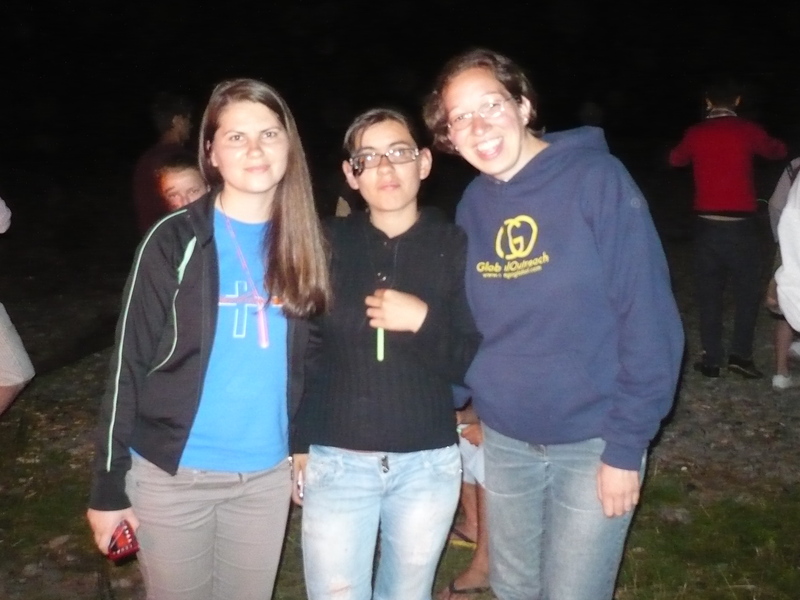 Mirabela, Sandi and I at the campfire. gave their lives to Christ were the “tough ones like the ones that smoke, etc. It really showed me that you really don’t know what is going on in their hearts but God does. What an incredible week at camp and I just praise God for what He did!! If you could please remember to keep these precious orphan kids and teens that they will continue to move forward with God and it won’t stay at camp of what God did in their lives! Thanks for your prayers!